My project "ethereal" is shot entirely with a Holga camera on infrared film. When shooting with a Holga, I feel like I'm recording a mood as much as the image itself: always fleeting, tunnel vision, dark and distorted around the edges. It's like capturing images in a dream. The first group of images in the project were shot at Japanese gardens throughout the Northwest. 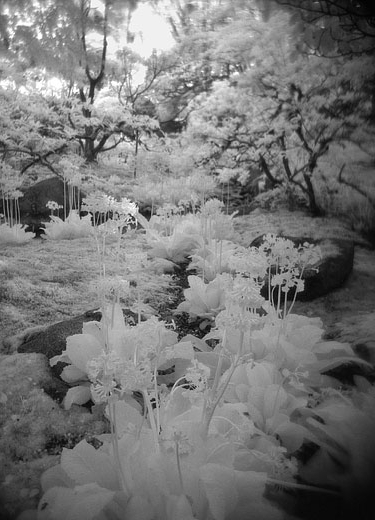 The play between the three (subject, camera, and film) is unique and beautiful as the distinctive qualities of the Holga and infrared film accentuate the mystique and calm of the Japanese garden. The effect is soft, surreal, and somewhat impressionistic at times. ethereal II was shot at various gardens and arboretums. ethereal III was shot during several trips to the Olympic rainforest. miscellany is a collection of some of my other Holga images. These were shot with both infrared and standard b&w films. Several of these images are traditional multiple exposure images (no manipulation).